Our experience has taught us that in order to end hunger and achieve lasting nutrient security, we must tackle two interrelated challenges facing vulnerable families around the world: a lack of access to diverse, healthy food and a lack of education around proper nutrition. We need healthcare systems that ensure families are equipped with the knowledge to make informed decisions around their children’s nutrition. We need food systems that ensure all families have access to a diverse array of nutritious foods. And we need to link the two. Our Child Nutrition Program is where we put this into action. We work with 20 Health Centers across three districts of Rwanda to implement our integrated nutrition and agriculture programming for vulnerable smallholder families reaching 3000 number of people annually. Our 14-week health training curriculum addresses the many factors beyond household food production that can contribute to malnutrition. Because malnutrition is complex, there is no easy solution. In recognition of this reality, our health curriculum provides families with the comprehensive knowledge they need to tackle malnutrition from every angle. Our curriculum was designed in partnership with the families we serve and is delivered by talented community leaders. For families struggling with malnutrition, virtually every resource - from money, to time, to firewood and water - is limited. 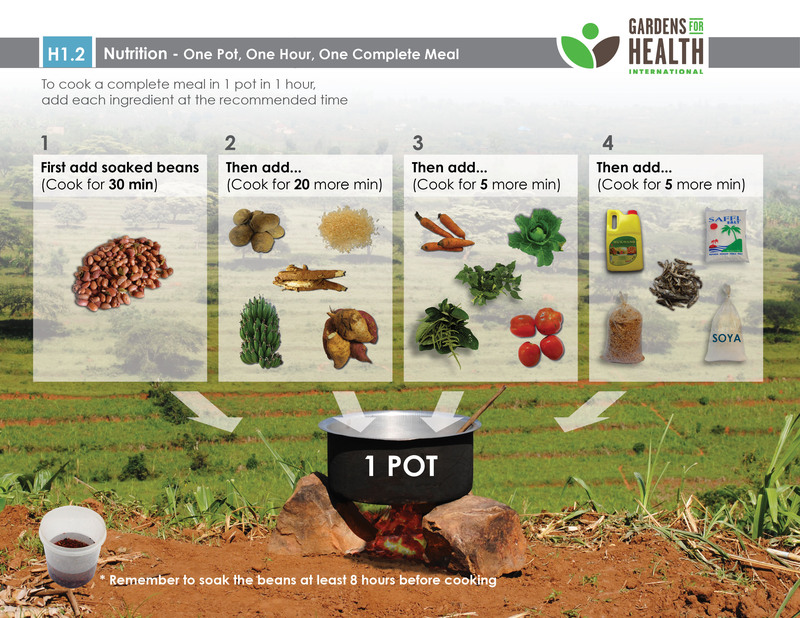 Our innovative “One Pot One Hour” nutrition behavior change methodology was developed in response to these resource constraints faced by many smallholder Rwandan families. Families are taught to prepare a balanced meal using ingredients that are readily available and affordable with the tools they have on hand, often just a single stove and pot. Not only is our One Pot, One Hour meal an integral part of our model to combat childhood malnutrition in Rwanda, but in 2015 this approach was adopted by the Rwandan Ministry of Health and shared with 44,000 Community Health Workers across the nation as part of national efforts to improve nutrition in the first 1,000 days of life. Our agriculture team works to blend international innovations in sustainable agriculture with time-tested Rwandan farming practices to ensure every family we work with can make the most of their existing resources. Caregivers meet in small groups throughout the course of the program to receive practical, hands-on agriculture trainings. These trainings are designed to help families build and sustain productive home gardens to increase accessibility of nutritious foods. Training topics include bed building, planting and transplanting, in-season care, pests and diseases, seed saving, composting, and more. Our approach to agriculture is premised on the belief that we must invest in the health of the land families farm in order to effectively improve long-term physical health. To that end, our weekly agricultural trainings are designed to promote sustainable farming practices that improve soil quality and reduce soil erosion while also improving access to a diversity of foods. Our Home Garden Package is the core deliverable that we provide to each family in our program. It includes small livestock (chickens or rabbits) in addition to two seasons of seeds and seedlings. We prioritize indigenous vegetables with seeds that can be saved so that families can continue to nurture a thriving home garden well after our program concludes. Our Home Garden Package is designed with the element of choice in mind. Families are not simply given a standardized, one-size-fits-all seed package. Instead, we give them the knowledge they need to make an informed decision about which crops will grow best on their land, most improve their diet, and earn the most income at local markets. Families have the option to choose a variety of crops from various categories. Our Early Childhood Development Program was started in 2013 to complement our investment in the physical development of children with cognitive and social development. The ECD program is a natural extension of GHI’s efforts to provide holistic and integrated support to the families of children with malnutrition. While we see agriculture as a key driver of health, we understand that seeds alone won’t solve the core problem of malnutrition. Emphasis must also be placed on ensuring the healthy physical, mental, and social development of children. At each of our partner health centers, talented ECD caregivers manage nourishing and socially stimulating environments for the children of all the caregivers enrolled in our Child Nutrition Program while their parents participate in health trainings. In order for our caretakers to best absorb training content during trainings, they need to know that their children are not hungry and that they will not be disturbing class time. As part of the program each child receives SOSOMA (a fortified porridge blend) and a stimulating environment to interact with other children their age.